Merry Christmas! Having my birthday on this day is very special because I can generally be assured that nobody forgets it. But because my friends and training buddies are usually celebrating with their families, I've never gotten to do a birthday smashfest with friends on my actual birthday. I've gotten used to just heading out to run a few miles by myself. Well, that changed today! 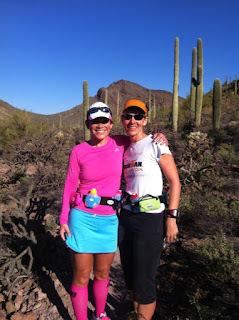 I got to celebrate my 37th birthday with a bike/run brick with Linda - Hooray! Today's ride gave new meaning to getting blasted on your birthday...it was winnn-dy. With gusts. Yipes! The wind steadily picked up throughout our 25 mile ride, and we got to ride back down Blanco with a cross-tailwind that carried us home at 30 mph. That is my very favorite road in the whole city to ride - what a treat to get to fly down it on my birthday! When we got off our bikes back at the cars, we were amazed at how strong the wind had become. A shopping cart had been pushed across the Target parking lot into Linda's car. After she propped it up on a curb, the wind was so strong that it knocked it down and sent it flying across the parking lot again! We noticed the flags flapping in the parking lot across the road and decided that we needed to take a picture to prove how ridiculous the wind was (and how awesome we are for riding in it - haha). Just moments after we took our photo, a huge gust literally blew Linda over and almost knocked her off her feet! She grabbed my arm and I caught her and she didn't fall down. After a minute of uncontrollable laughter, we took off and ran our easy 20 minute run. Maybe next year I can find a way to do a 100x100 swim for my birthday, but until then, Merry Christmas and happy new year! I think it's going to be Smashing! I swam today for the first time in a month. Talk about feeling like a fish out of water...it's amazing what you lose after 30 or so days of not doing something you've previously done 3 times a week for several years. I've been letting the cut on my knee heal for as long as I could stand it. Yesterday, I decided that enough is enough! I got permission from my handy doctor/training buddy Aixa, and made plans with her and Shelly to meet at the pool this morning at 5:45. It was 55 degrees this morning. On the way to the gym, I got a text message - Aixa bailed. To be fair, she works flexible hours and has no reason to show up in the cold and dark at an outdoor pool at 5:45 am. Shelly was there when I arrived and I jumped into the pool to get warm. Only one other swimmer was there - a far cry from the crowds that we fought with for lanes last summer. Shelly hadn't been to the pool in over a month either. We began swimming side by side and I immediately noticed the difference - I just felt SO SLOW. And then after the drills were finished, I felt tired. My lower back was sore. I got through the 500 straight and then the first 250. And by the end of the second 250, my form was so ridiculously bad, I just gave up on the rest of the workout and kicked with a board to cool down. This evening, I'm already sore from swimming this morning. My last swim was at Ironman Arizona. I swam 2.4 miles straight in an hour and 18 minutes. Today, I swam half that distance and it took almost as long. I have my work cut out for me to get back up to speed in the pool. But I don't mind - I'm training 100% for triathlon again and it feels great. Now a before and after pic of my knee! Just stop here if you're squeamish (it's really not that bad). With my sights set on Ironman Texas in May, it isn't too difficult to plan out the next few months. For Dawn's other athletes training for Texas, training officially began 2 weeks ago. She told me to take it easy the next month or so, and start hitting it hard again in January. Even though I didn't finish the race at Ironman Arizona, I'm supposed to recover like I did the whole thing. I can't swim yet because the deep cut on my leg is still healing. (I didn't end up getting stitches. At the urgent care, they told me that it would just need to heal, and that it would take a long time to do so, and they were right.) But I have been biking and running - I've pretty much been following Aixa's base building plan (with Dawn's blessing. She says I just don't need to feel "obligated" to do all the workouts). It's comforting to get back into the routine, although it's also nice to have an excuse not to get up super early 3 mornings a week to swim. As I notice my newly crowned Ironman friends around me lacking motivation to get out there and train (ahem, Shelly! ), I'm glad to have a carrot to chase through the holidays. I'm pretty sure that I'd be very unmotivated right now as well if I didn't have anything big coming up. My favorite thing right now is having permission to blow off structured workouts and just going out to ride! Shelly and I had an awesome ride out to Castroville on Tuesday, just chit chatting our heads off like old times. We're already looking forward to riding the Helotes loop/211 next week. So we'll have some fun for a while... and then the work will begin again. Starting in January, basically, I get a month of Build 1, a month of Build 2, a month of Race Prep, then Taper, and then May 18 will be here! The coolest thing is that I'll be attending Hillary Biscay's awesome training camp about 6 weeks before the race - which is pretty much perfect timing. I had already signed up for the camp because I loved it so much last year. I was feeling kind of weird about going without having an ironman on the calendar to train for - I guess that worked itself out! Last year, Shelly and I had a totally amazing, transforming experience there - that camp turned us into athletes and set us on a road to believing in ourselves as real competitors. We grew just through completing the workouts. This year, I want to see how far I've come. I'm psyched to have friends going to camp (as well as Coachie), and I can't wait for Aixa, Linda, and Herb to experience the camp. I hope they get as much out of it as I did last year. I'm also looking forward to the structured training led by Coachie, particularly the trip out to Vanderpool in February (probably not on Shelly's birthday this year, haha) to smash some hills. We have a 1-hour timed swim coming up in January, which is something I've never done before. 2013 is looking like fun! Ok, so one of the reasons that I hadn't blogged in a year was that I was busy training for Ironman. But the other reason was just that ever since I got an iPhone, I stopped using the computer at home. It's upstairs and a Mac and I hate it (sorry Robert). Solution: Chromebook! As Robert says, it's basically a giant iPhone shaped like a laptop (but at $200, it isn't an iPad and anyway it has a keyboard). Being as technologically unsound as I am, I can understand that description. We swiped the last one out from under a pack of teenage boys at Best Buy yesterday, and now I'm planning to document my Ironman Texas training experience in a little more detail than the last one. That is, if I can just stay off Slowtwitch on this thing.